The official announcement just came in, confirming pretty much everything that we already know from the leak. 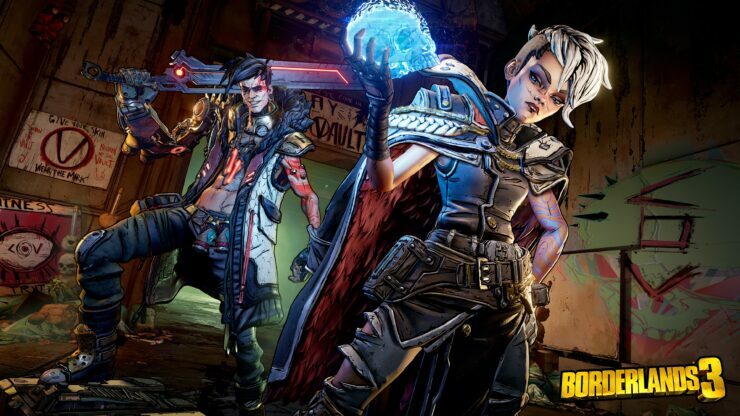 Borderlands 3 will launch on September 13th on PC, PlayStation 4 and Xbox One, with Epic Games Store getting a timed exclusive until April 2020. The full gameplay reveal will happen on May 1st. In addition to that, though, the press release revealed that the developers have partnered with AMD to deliver optimized experiences on Radeon GPUs and Ryzen CPUs. For the past several years, the team at Gearbox Software has been devoting every ounce of our passion, creativity and love into making Borderlands 3 the biggest, baddest and most ambitious Borderlands adventure we’ve ever made. 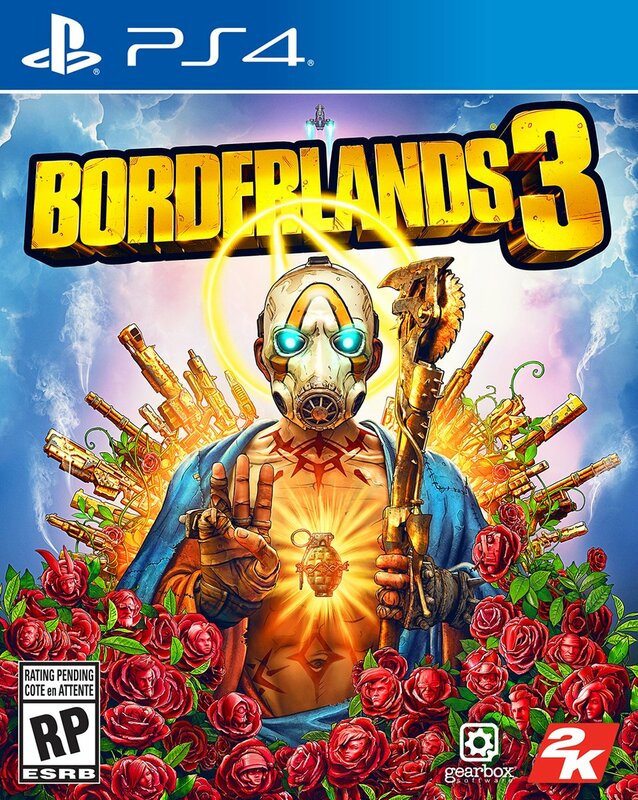 Borderlands 3 is being crafted not only as a love letter to fans of the series, but also as an ideal entry point for new players to jump-in alone or cooperatively, on or off-line, in the latest and greatest installment of the definitive best-in-class benchmark shooter-looter. Borderlands is one of the most recognized and celebrated franchises in gaming. We’re proud of the work and dedication of our partners and Gearbox, who are making a game that will not only reignite the millions of existing Borderlands fans but welcome a new generation of players into this beloved universe. The PC gaming community has been an important part of the success of the Borderlands series, and we are excited to be partnering with Epic who recognize its worldwide popularity and share in our commitment to bring Borderlands 3 to this rapidly expanding audience. 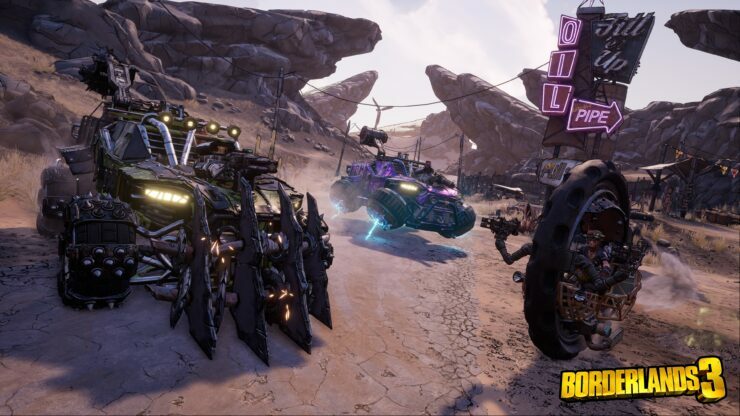 Our mission, in addition to delivering the most engaging and captivating entertainment experiences, is to embrace new distribution platforms that will contribute to our effort to grow the audience for Borderlands 3. There are also new screenshots, details on the game itself and even a brand new gameplay video. Check it all out below. The original shooter-looter returns, packing bazillions of guns and an all-new mayhem-fueled adventure! Blast through new worlds and enemies as one of four brand new Vault Hunters –the ultimate treasure-seeking badasses of the Borderlands, each with deep skill trees, abilities, and customization. Play solo or join with friends to take on insane enemies, collect loads of loot, and save your home from the most ruthless cult leaders in the galaxy. A Mayhem-Fueled Thrill Ride: Stop the fanatical Calypso Twins from uniting the bandit clans and claiming the galaxy’s ultimate power. Only you, a thrill-seeking Vault Hunter, have the arsenal and allies to take them down. Your Vault Hunter, Your Playstyle: Become one of four extraordinary Vault Hunters, each with unique abilities and playstyles, deep skill trees, and tons of personalization options. All Vault Hunters are capable of awesome mayhem alone, but together, they are unstoppable. Moze as THE GUNNER: When Moze needs backup, she digistructs her mech–Iron Bear –for a sucker punch of additional firepower. Lock, Load, and Loot: With bazillions of guns and gadgets, every fight is an opportunity to score new gear. Firearms with self-propelling bullet shields? Check. Rifles that spawn fire-spewing volcanoes? Obviously. Guns that grow legs and chase down enemies while hurling verbal insults? Yeah, got that too. New Borderlands: Discover new worlds beyond Pandora, each featuring unique environments to explore and enemies to destroy. Tear through hostile deserts, battle your way across war-torn cityscapes, navigate deadly bayous, and more! Quick & Seamless Co-Op Action: With a new level-sync system, the experience scales for each individual player. That means you can play with anyone at any time online or in split-screen co-op, regardless of your level or mission progress. Take down enemies and challenges as a team, but reap rewards that are yours alone –no one misses out on loot. Bazillions of Guns: With multiple distinct weapons manufacturers, a revolutionary content generation system, and special legendary drops to uncover, your ever-improving arsenal comes with near-infinite possibilities. RPG Progression: Slay your foes, gain experience points, and build out extensive skill trees unique to each of the four Vault Hunters. 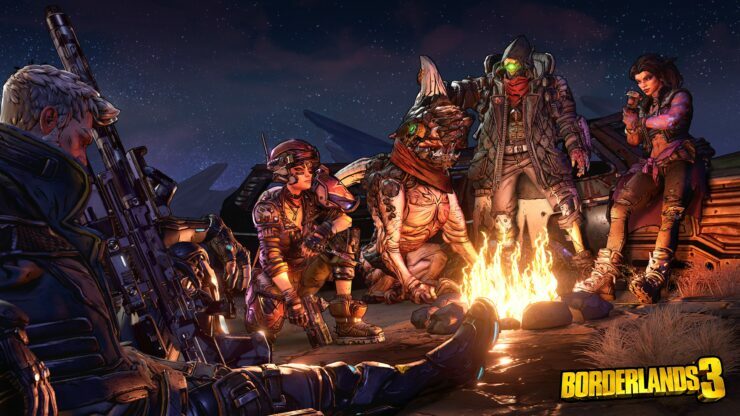 Rich Universe: Uncover the rewarding mysteries, memorable inhabitants, and deep lore of the extensive Borderlands narrative universe. Intense Vehicular Combat: Get behind the wheel and engage in frenetic vehicle-to-vehicle combat. 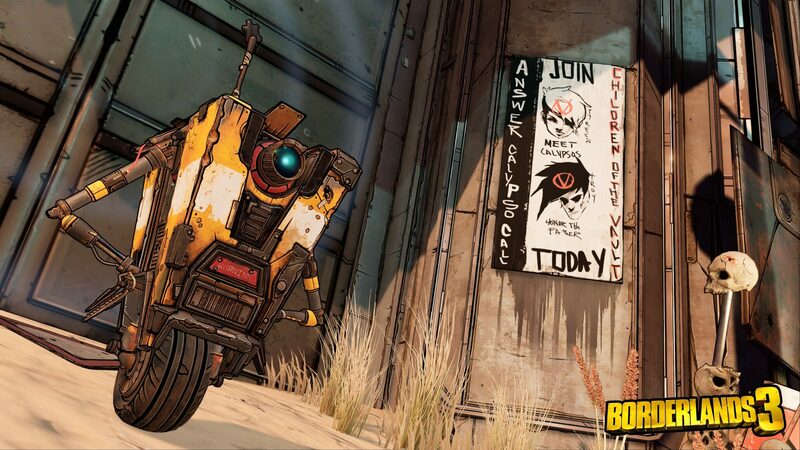 Radical Art Style: Traditional rendering techniques combined with hand-drawn textures give Borderlands its iconic style. 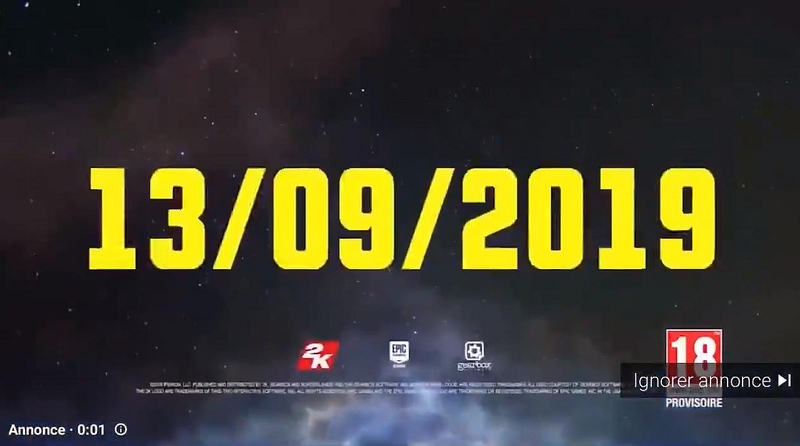 Leaks for Borderlands 3 continue unabated and this time, we have the game’s release date, apparently pinned for September 13th. Additionally, while this is not entirely clear yet, the ad only shows the Epic Games Store logo instead of Steam’s, suggesting it may indeed be an exclusive on PC as some had surmised. 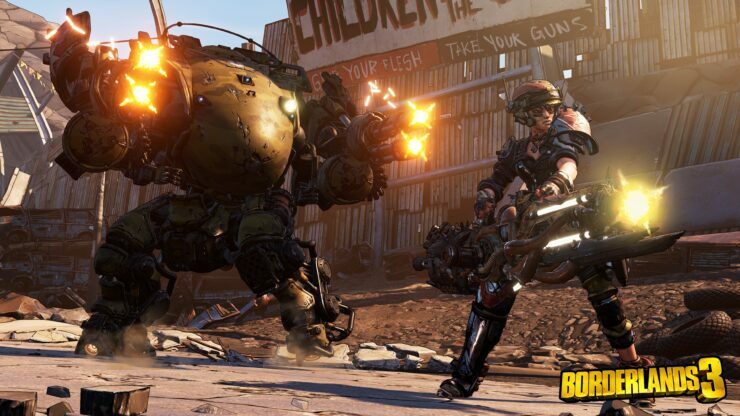 For the record, Borderlands 3 is developed on Unreal Engine technology, which means that they won’t have to pay Epic the usual 5% royalty fee for any proceeds coming from the Epic Games Store. For what it’s worth, just a couple days ago Gearbox boss Randy Pitchford didn’t deny the rumors surrounding a possible Epic Games Store exclusivity, though he did hint it might only be six months long instead of twelve as usual for the other games. 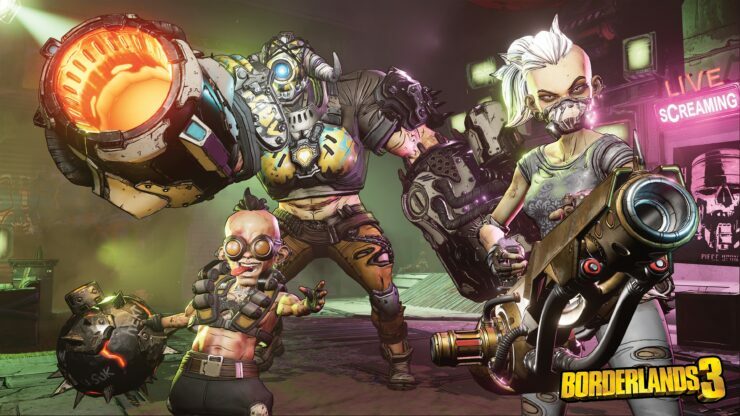 He also pointed out the studio’s interest in cross-platform play, which could bode well for the feature being in Borderlands 3. 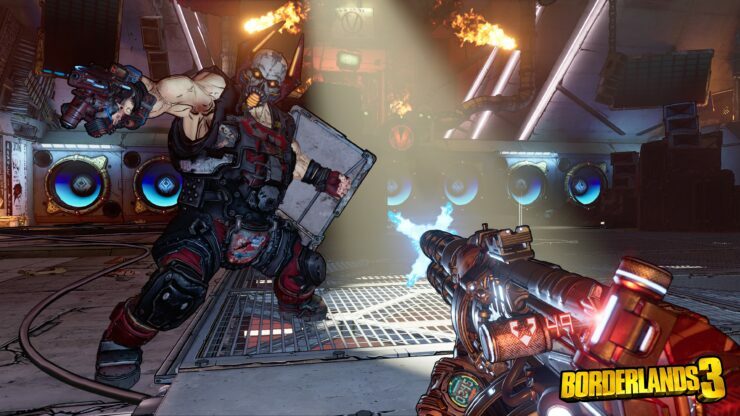 2K/Take-Two has exclusive publishing rights for Borderlands 3 and makes all decisions regarding price-points, territories, distribution and platform partnerships. Please direct all inquiries regarding any of those topics to 2K. We are *just* the talent. For what it’s worth, 2K’s decisions aside, myself and the team at Gearbox have a very keen interest in cross-platform play. We believe multi-platform support is a pre-requisite and Epic’s leadership with cross-platform support is helpful to our interests there. As spotted by the ever-vigilant Wario64, Borderlands 3 also got its cover art leaked for all the various editions. There will be a Deluxe Edition, a Super Deluxe Edition and a Diamond Loot Chest Collector’s Edition, in addition to the Standard Edition, of course. We also know the contents of the Diamond Loot Chest Collector’s Edition (presumably the most expensive one), and there’s a Season Pass as well, unsurprisingly. We’ll know a lot more details about Borderlands 3, including the game’s full features set and likely pricing as well, later today at 6 AM Pacific Time as that’s when the official reveal is happening. Stay tuned and we’ll update this post accordingly.